Ben rarely comes home for lunch, but the day I texted him a photo of this finished Whole30 Salmon with avocado sauce, he hopped right in the car and was home, fork in hand 10 minutes later. 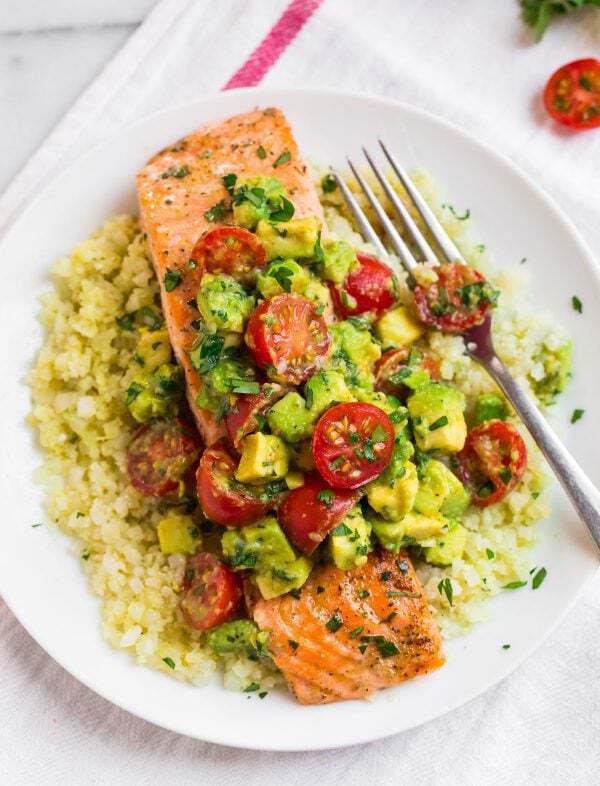 Moist, flaky salmon fillets flavored with cilantro and lime, this fresh, healthy meal is now one of his most-requested dinners. Since it’s so easy to make, it’s one I love cooking too! Whenever I’m lacking healthy dinner inspiration or I need a quick weeknight meal for myself and Ben, baked salmon is my go-to. I find this absolutely hilarious, because I spent most of my adult life being afraid to cook fish. We didn’t grow up eating fish at home, so I assumed cooking something like this Whole30 salmon recipe was fancy or complicated. I could not have been more wrong. This recipe is painless and appropriate for cooks at any level, and the flavor payoff is supreme. 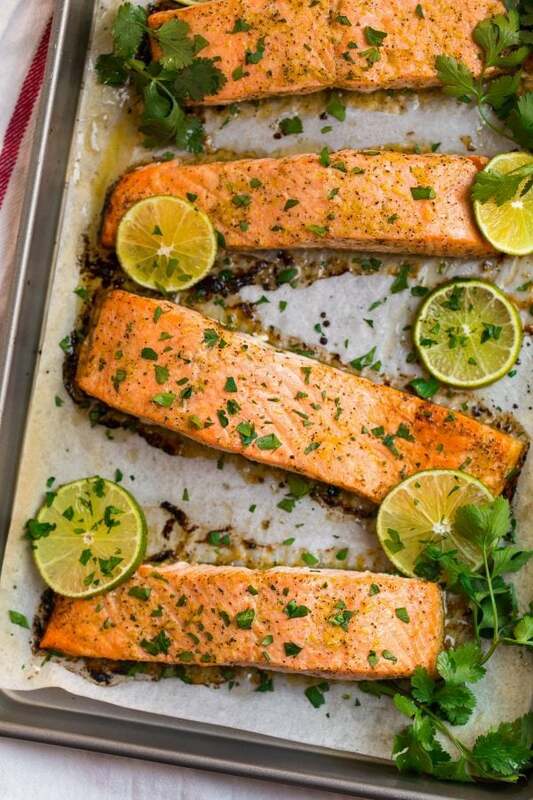 Arrange the salmon on a sheet pan. Stir together a quick mix of garlic, lime juice, and olive oil. Pour this tasty garlic-lime biz over the top of the fish (yep, right on the pan). Let hang out 10 minutes. I like to call this lazy girl marinade, because you don’t even need to place the salmon in a separate dish. I also opted to make a super fresh, you-won’t-believe-it’s-winter avocado “sauce” with tomatoes, cilantro, and even more lime. It’s fresh and zippy, and just when you think you’ve added enough to the top of the salmon, you’re going to want to go back and add some more. For those doing Whole30 this month, this recipe is Whole30 friendly (and Paleo). Salmon is Whole30 compliant in general, so I’d also recommend checking out my other salmon recipes, including this Baked Salmon in Foil, Soy Ginger Salmon (coconut aminos can be swapped for the soy sauce and the honey omitted to make it Whole30 compliant), and Pineapple Glazed Salmon with avocado sauce. From there, I have a list of 15 Whole30 Recipes for you to explore, the most popular being these Whole30 Vegetarian Power Bowls. Cauliflower rice (pictured) is absolutely delicious and adds an additional serving of veggies. If you aren’t following a Whole30 diet, you can swap the cauliflower rice for prepared brown rice or quinoa if you prefer. Regardless of what diet you do or do not follow, I hope you’ll try this Whole30 Salmon recipe no matter what. It’s a lovely combination of creamy, flaky, and fresh. Every forkful tastes wholesome in a rich, nourishing way that feels restorative and satisfying and not at all like what you are eating is “diet” food. Because it is so fast and simple to prepare, it will be a trusty companion on busy weeknights too. Tender, flaky Whole30 Salmon. 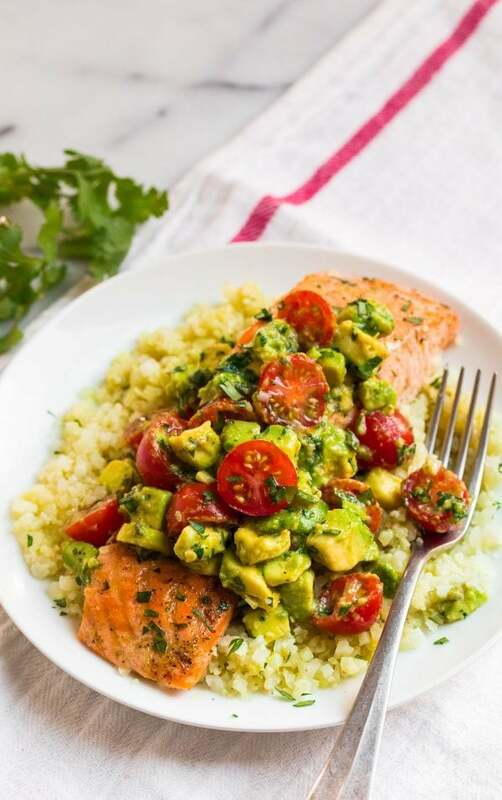 Flavored with cilantro and lime and topped with an easy avocado sauce, this baked salmon recipe is quick and delicious! Place a rack in the center of your oven and preheat the oven to 400 degrees F. Line a large rimmed baking sheet with aluminum foil or parchment paper. Arrange the salmon fillets in the center of the sheet. 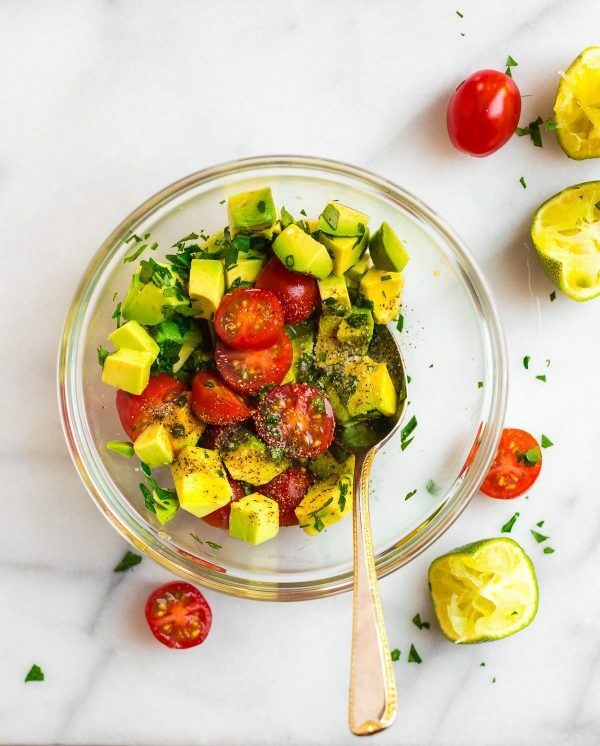 In a small bowl or large measuring cup, whisk together the olive oil, garlic, lime zest, lime juice, salt, and pepper. Drizzle and brush generously over the salmon. (You will have some run off and down the sides, but brush what you can onto the fish.) Let the salmon stand at room temperature for 10 minutes while the oven finishes preheating. Bake until the fish flakes easily with a fork and reaches an internal temperature of 145 degrees F, about 16 to 20 minutes. * Cover and let rest 3 minutes. 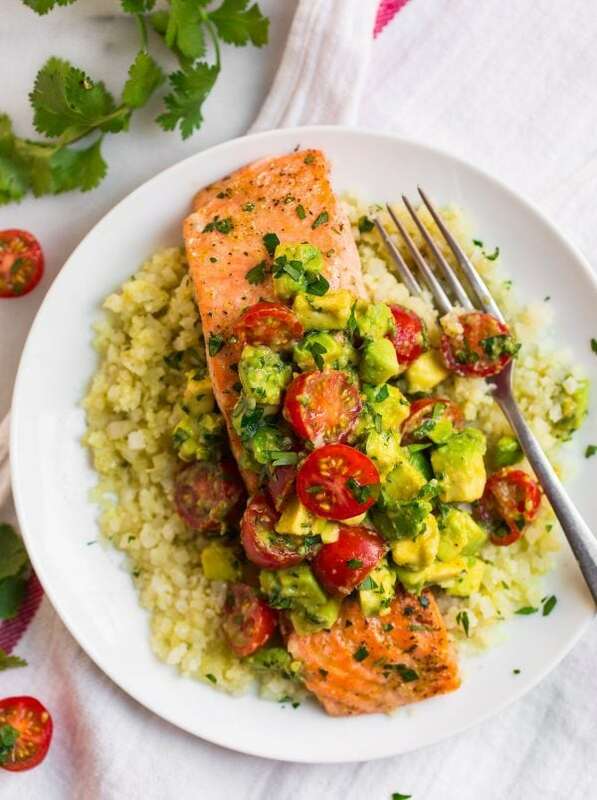 While the salmon bakes, prepare the avocado salsa: In a large bowl, stir together the avocado, lime juice, hot sauce, garlic, salt, pepper, and cilantro. With a fork, gently crush pieces of the avocado and stir. You want them to break down a little and make the salsa creamy, but you should have plenty of chunkiness remaining. Stir in the tomatoes. Taste and adjust seasoning as desired. Transfer the salmon to serving plates. Serve hot, topped with avocado salsa and a sprinkle of fresh cilantro. *The cooking time will vary based upon the thickness of your salmon. Thicker (2-inch-plus) slices will need several extra minutes, while thinner slices may cook more quickly. My salmon fillets were a little more than 1 inch thick and cooked in 18 minutes. This recipe is best enjoyed the day that it is made, as salmon usually dries out when reheated. If you have leftover salmon, try serving it room temperature over a salad the next day or flaking and scrambling it with eggs. hey girl- this looks so good! Lunch time! Thank you so much, Shawnna! I hope you enjoy the recipe if you give it a try! Hi Marcia! Thanks for letting me know about this. I’m currently in the middle of repositioning some of the ads, so the layout is really funky. Are you viewing on desktop or mobile phone? Are there any ads that are more disturbing than others? If you could let me know I’d appreciate it! I do always need to have some ads (since this is my full time job, we rely on my ad income for savings, our mortgage, expenses, etc and it actually costs quite a bit even to run the website) but if you can’t read the recipe, that is something I want to look into ASAP. Thanks for letting me know! Agreed about the ads. I’m trying to copy and paste the recipe from my phone to text and there are ads in the middle of the recipe . Salmon recipes looks great! I have just made it for this lunch following all steps of your instruction. The taste was quite good but next time I would use 1/2 this amount of salt due to my dad found it too salty for him. Anyways, thanks so much for the great recipe! Mary, thanks for reporting back! I’m glad to hear you enjoyed it! Simple meal with a good twist. I make something similar and never thought of using avocado. Thanks! I hope you enjoy the avocado addition, Alex! I’m not following Whole30, but I just love the look of this salmon! The avocado salsa pushes it over the top! Such a light, bright a cheery meal! I especially love the avocado salsa. I love that I don’t feel guilty when I finish my plate with delicious food like this! This quickly became a new favorite in my house! My new favorite way to make salmon!! Just made it!! It was absolutely delish!! I did a bed of mashed cauliflower with a little ghee and salt and pepper and it was so good. Oh, and I had to sub fresh parsley for cilantro…really, really tasty! Soooooo excited to hear this Helen! Thank you for trying it and for taking time to leave this lovely review! The avocado “salsa” was outstanding. Great recipe! Hooray! I’m glad you enjoyed it, Jaime. Thanks for taking the time to leave a review too! This one is a winner!! Definitely a new household fav. Thanks for the recipe! I’m glad to hear it, Karlie! Thanks for taking the time to review!